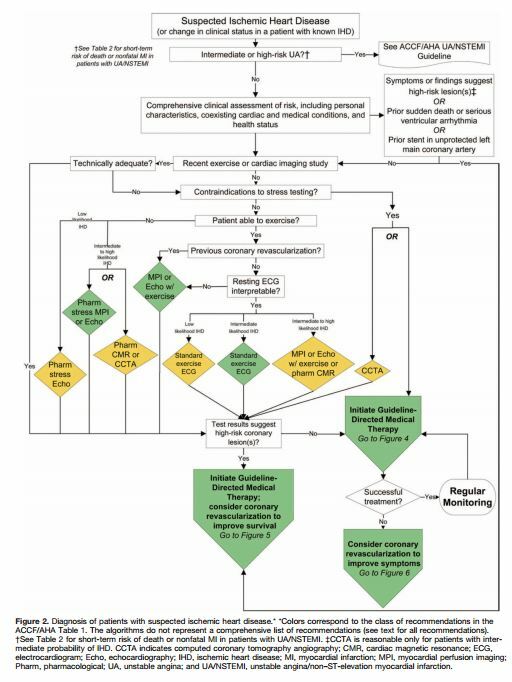 What follows is from the 2012 ACCF/AHA/ACP/AATS/PCNA/SCAI/STS Guideline for the Diagnosis and Management of Patients With Stable Ischemic Heart Disease. [Full Text HTML] [Full Text PDF]. Circulation. 2012; 126: e354-e471. When a patient presents in any clinical encounter with the symptom of new or a change in established chest pain (by phone, in the office, urgent care center, or emergency department), the questions of Table 2 should be asked and answered first. In this way the patient with possible CAD symptoms can be classified into one of the three risk groups. Patients in the first two groups require immediate evaluation in the emergency department. Patients in the third group, can be evaluated using these 2012 ACCF/AHA guidelines. But after asking and answering the questions in Table 2, you also want to consider other possibly life threatening conditions presented in Table 7 which I have inserted right after table 2. So you’ve reviewed Tables 2 and 7 and you decide that the patient can be evaluated in the office and that the initial diagnostic evaluation should be noninvasive. And so you proceed by using Flow Chart in Figure 2 below. And then you look at the noninvasive workup to determine the risk of heart attack or death. If there are any high risk findings that suggest that revascularization might reduce his/her risk of death or serious heart damage, then you want to consider coronary angiography. Review w/u looking for the findings in Table 14. 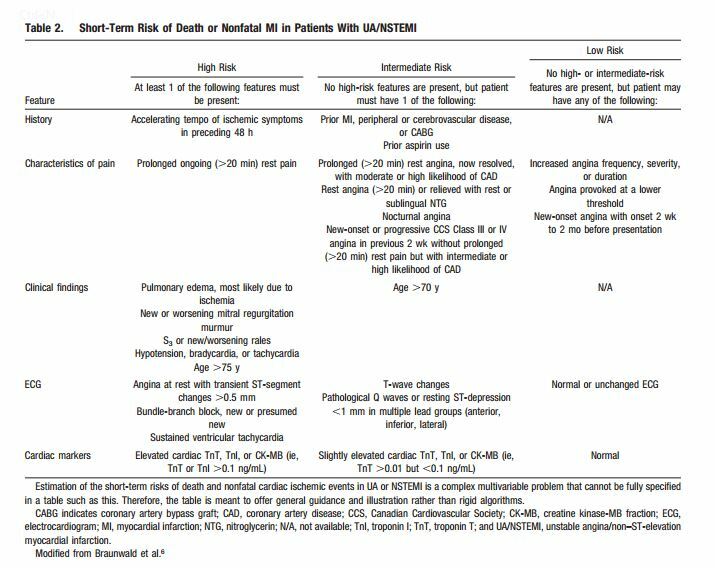 If the patient falls into high or intermediate risk, then serious consideration of coronary angiography is indicated to determine if revascularization can lessen that risk. And the diagnosis of stable ischemic heart disease requires the initiation of guideline directed medical therapy as per Figure 4. 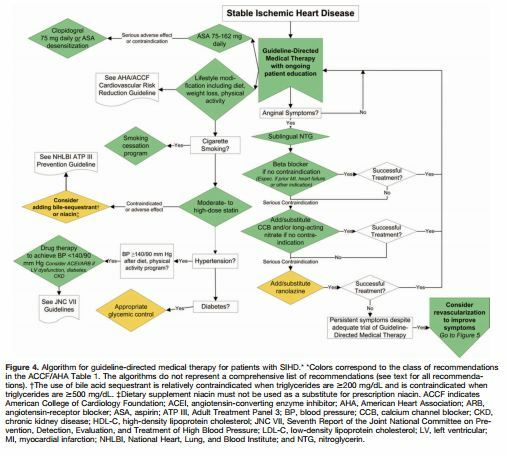 2012 ACCF/AHA/ACP/AATS/PCNA/SCAI/STS Guideline for the Diagnosis and Management of Patients With Stable Ischemic Heart Disease. [Full Text HTML] [Full Text PDF]. This entry was posted in Cardiology, Emergency Medicine, Evaluation of Symptoms, Exercise Stress Testing, Family Medicine, Guidelines, Internal Medicine, Medical Imaging, Symptoms. Bookmark the permalink.